"Lingao puppet show is our local traditional culture, we must pay attention to its protection," said Wu Shaoyun, member of the Hainan Provincial Committee of CPPCC, suggested to protect the Lingao puppet show and gained extensive attention. According to Wu Shaoyun,although 13 puppet troupes are still showing in different villages of Lingao County with a population of nearly half a million, most people are no longer having a passion for the puppet show like before especially teenagers. The puppet troupes lack people who can direct, write and compose. The theoretical research is weak. The number of actors over the age of 50 is in the majority and lack of young people. Most of the troupe programs are old scripts that far from satisfying the growing cultural needs of people. 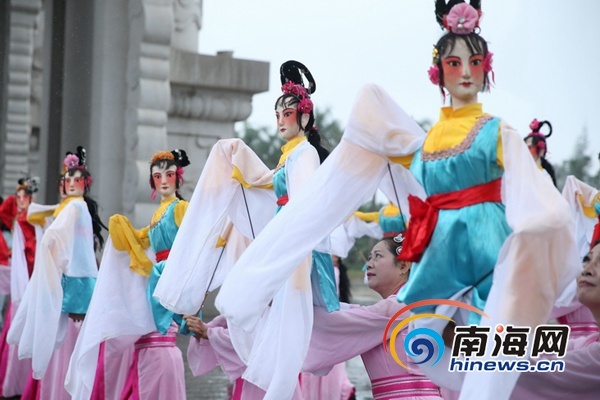 In addition, the audiences dwindle day by day and the Lingao puppet show has a depressed market due to some reasons such as the dated system, old ideas, lack of talents, lack of high-quality programs and old-fashioned performance. "such unique national culture should be seen by more people. We should add new things to the Lingao puppet show," Wu Shaoyun suggested that for the situation of lacking of talents, it should integrate talent resources, selecting talents from the existing 13 puppet troupes, consisting the "Lingao puppet show association" that led by local Style Council, regularly holding the various seminars and performance, promoting the overall level of talent through frequent communication and interaction. We should select potential talents and send them to various art schools or theatrical troupes to communicate and study, training talents from primary and secondary school students, paying attention to the training of art and train the talents in time. We should also set up the experts team to explore the lost skills and content of Lingao puppet show.We also should have the standardized assessment for the performance content . He also suggested that the relevant government departments should play their leading role and formulate the flexible and efficient management methods and reward systems; integrating different resources, having the different modes of performances and activities such as exchanges of official organization, commercial performances, combining the exchanges and commercial performance.We should encourage enterprises to participate and explore different industries suitable for the characteristic of puppet show. For example, the development of puppet art and cultural industry park, should develop the art of puppet show through the interaction of economic benefits.